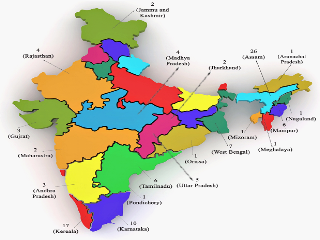 Beginning of the programme: March 2011. This is a very well structured training programme designed by Alcon. Perhaps this is the only hands on training programme ever executed in India where trainees are taught with expert’s hands literally on them. The key personnel in this programme are the Clinical Assistant Specialists (CAS) - a team of well trained young and energetic persons who wholeheartedly devote their time and energy to make an ophthalmologist a competent phaco surgeon. A CAS is assigned to every single trainee. He is with the trainee during pre training evaluation, training and post training. 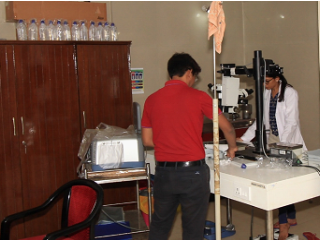 During training at PDP centre the CAS spends hours after hour with the trainee in the WET LAB where phaco surgery is practiced in goat’s eye. The WET LAB has the most sophisticated and advanced LEICA operating microscope with equally efficient observation scope. In a typical training day the morning starts with DIDACTIC LECTURES according to the training schedule. 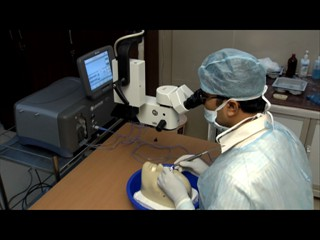 The lectures deal with Patient Selection and Pre op, Wound Architecture, Curvilinear Capsuhlorrhexis, Hydro dissection, Nucleus Disassembly and Removal Techniques, Phaco Dynamic and Fluidics, OVD, IOL Technology and Implantation Technique, Avoiding and Managing Complications & Anterior Vitrectomy during the two weeks training period. 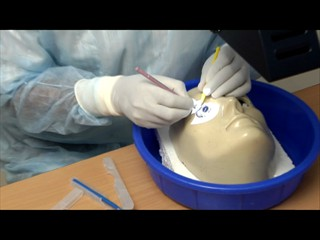 The trainees then examine the Post Op patients. After post ops they go the main operation theatre and observe experts performing phacoemulsificatio surgery. 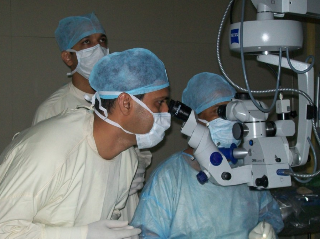 They observe the surgeries through excellent observer scope fitted in LumerT Zeiss Microsope. At 11AM they go to the WET LAB and practices surgery under the guidance of the CAS. They iron out their faults as pointed out by the expert. At 3 PM they again go the main operation theatre to do live surgery under the guidance of the expert. The CAS is around to work with different parameters and other things. At 6PM video review of the cases is done by the trainees where the trainee, experts and the CAS participate. • Post Op data collection and discussion with trainer on patient outcome.